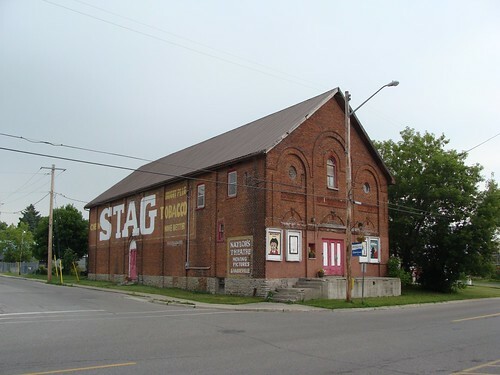 It’s hard to believe these days, but Naylor’s Theatre in Deseronto was once on a theatrical circuit which included far more famous venues such as Washington’s National Theatre, Philadelphia’s Orpheum Theater and New York’s Broadway. 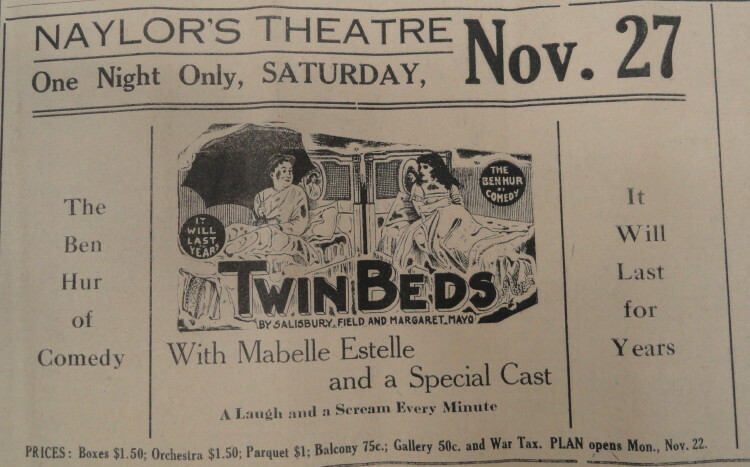 This advertisement from The Deseronto Post of November 24, 1920, is for a touring bedroom farce called Twin Beds, starring actress Mabelle Estelle (who was originally from Scranton, Pennsylvania). Twin Beds was written by Salisbury Field and Margaret Mayo and was produced by Selwyn & Company, owners of the Selwyn Theater at 229 West 42nd Street in New York (now the American Airlines Theater). Edgar Selwyn (1875-1944), who had founded the company, was also a co-founder of Goldwyn Pictures. Margaret Mayo was his wife. The play was based on a novel and was also turned into a movie four times. The show was obviously a popular one: it appears seven times in the timeline of plays at the National Theatre between 1915 and 1925 and had run on Broadway for a year before that. It returned to Washington D.C. in the May of 1921, where it was favourably reviewed in the Washington press. We can find all this out from the Library of Congress, which has an excellent online newspaper service called Chronicling America. This allows searching across a range of digitized American newspapers from 1836 to 1922. You can also download images of the newspapers which interest you. The picture below is from The Washington Times of May 1, 1921 and shows Mabelle Estelle. You can click on the image to go to the page of the newspaper on the Chronicling America site. Naylor’s Theatre is now silent and empty, unlike its Washington and New York counterparts. It’s difficult now to imagine a time when stars of the American stage would have been staying in Deseronto on a regular basis!